The 2012 chevrolet camaro electric vehicle qualifies for a federal tax credit of up to $7,500, effectively reducing the net base price. Given these tough economic times, the Camaro is a car that shouldn't exist. Economic crises have a way of killing off muscle cars (think of the 1970s oil embargo or the recession of the late 1980s), so maybe the fact that the 2012 Chevrolet Camaro is flourishing is a sign that better times are not far off. Of course, when it comes to things like safety and fuel economy, today's Camaro is light years ahead of it ancestors, yet it is equally as powerful as the most legendary Camaros of yore. Heck, the base Camaro V6 car has more horsepower than some of the late 70s and early 80s V8 Camaros! Yet for all its improvements, the Camaro continues to annoy environmentalists and government regulators alike, which is probably why so many people love this car. Also appealing is the long-held friendly rivalry with fellow domestics the 2012 Ford Mustang and 2012 Dodge Challenger. It's a flashback moment to a time when names like Toyota and Honda were barely known, and cruising the boulevard in a big, loud American muscle car was a Saturday night ritual. Be it the 323-horsepower LS, the 426-horsepower SS or the 550-horsepower ZL1 (reviewed separately), in Coupe or Convertible, there is a Camaro to fit just about every need and budget. If you're looking for a high-performance machine that offers the best dollar-to-horsepower ratio in the business, check out the 2012 Chevrolet Camaro. In SS form, it outmuscles most exotics costing twice as much. If there is a sacrifice to be made for the Camaro's modest sticker price, it resides in the car's cockpit. If hard surfaces and cheap plastics are a deal breaker, you might want to check out the Ford Mustang instead. Those hoping to find the light, agile handling of a BMW at a Chevy price will be sorely disappointed. For 2012, the V6 Camaro gains an additional 11 horsepower, bringing its total output to 323. Also new this year is a 45th Anniversary package that adds specific hood and deck stripes, 20-inch wheels and special interior trim. Other changes include a new steering wheel design, a power lift feature for the passenger seat, and the addition of a rearview camera to the Rear Vision Package. The high-performance ZL1 is set to debut early in 2012 with a 550-horsepower supercharged V8 engine. We were given the opportunity to spend equal time in every Camaro trim, from the V6-powered LS to the 426-horsepower SS with the 6-speed manual transmission (our preferred choice as, due to the Active Fuel Management system, the automatic SS has 26 less horsepower). Admittedly, we enjoyed all the cars, but spent the lion's share of our time testing the SS. With its ever-present torque and seemingly endless horsepower reserves it's easy to make the SS go fast. Aided by GM's electronic launch control our Camaro SS was able to tackle the 0-60-mph run in 4.4 seconds, and thanks to the Camaro's multi-link rear suspension, rack-and-pinion steering, and substantial tires our Camaro SS was able to perform as well in the curves as at the track. You still have to use plenty of finesse to get this car around turns, but the enhanced traction provided by the StabiliTrak electronic stability control system (incorporates anti-lock braking, traction control and an active braking system to control wheel slip) is a great ally. Old-school drivers might object, but electronic launch control reduces the level of skill required to get off the line quickly, while "Competitive/Sport" modes for the stability system allow turning off many of the electronic aids, for doing your own thing. Certainly beauty is in the eye of the beholder, but we are of the opinion that the 2012 Chevrolet Camaro looks like a car that could command a much higher price tag. The details like the grille, rear roof pillars and taillights are simply gorgeous. Camaros of old were great in a straight line, but a lot less great around corners, especially if the road surface was uneven. With its multi-link rear suspension instead of a live axle, the new Camaro is much more at home in those challenging situations. Standing in sharp contrast to the brilliant execution of the Camaro's exterior is its rather lackluster interior. Large expanses of hard plastics on the doors and center console look and feel cheap, and will likely scratch easily over time. But, what the Camaro's interior lacks in execution it more than makes up for in design, with two large hooded binnacles housing the speedometer and tachometer, and an available gauge package for oil temp, oil pressure, volts and transmission fluid temp placed at the end of the center console. The thick-grip steering wheel feels welcome, but its position relative to the driver seems a bit high. Thankfully, the positioning and action of the manual transmission shifter is just right, as are the Camaro's supportive front seats. Some drivers did complain, however, about the absence of any form of adjustable lumbar support and everyone agreed the ridiculously tiny sun visors were all but useless when positioned to block the sun at the driver's side window. As for the Camaro's backseat, let's just say it is as small and confining as you would expect. Some cars attempt a retro feel that just looks odd or over the top, but the Camaro's design team nailed the spirit of the original without insulting it. 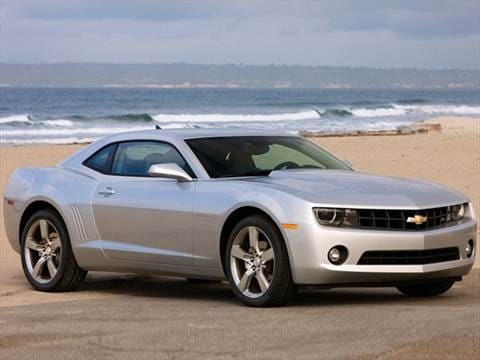 A stunning looker at every angle, the 2012 Camaro's visual appeal is striking. Nowhere is this more evident than the intersection between the massive rear fenders and the crisp-edged roof pillar, a joining that makes a bold statement as well as a massive blind spot for the driver. Of course, the aggressive recessed grille and headlamp treatment add an air of wickedness, as does the SS model's massive five-spoke wheel and tire package. Rounding out the look are classic hooded Camaro taillights and a subtle rear deck spoiler. Perhaps the most notable standard item is the Camaro's good looks, accompanied by a supple and responsive suspension that makes this the best handling, most comfortable Camaro of all time. Cloth-upholstered, 6-way manually-adjusted driver and passenger seat are standard. The 11.3 cubic feet of cargo capacity can be increased with the standard fold-down rear seat. All models include a three-spoke steering wheel with manual tilt/telescope adjustment, plus cruise control and rear defogger. The Camaro's standard entertainment system is a single-CD radio with six speakers, and it offers XM Satellite Radio. All models also include power door locks and express up-and-down windows. Standard safety technologies include front dual-stage airbags, front seat-mounted thorax side-impact airbags, head-curtain side-impact airbags for front- and rear-seat occupants, front-seat safety-belt load limiters and pretensioners and a front-passenger detection system that senses children and small-stature adults and suppresses airbag deployment when appropriate. While the base Camaro with V6 engine is reasonably well-equipped, some judicious checking of option boxes can add up to a more comfortable while still reasonably priced car. We liked the optional heated, leather-trimmed seats with driver 6-way power adjustment. On SS models, the seats feature a distinctive SS logo on the headrests with contrasting stitching, and an "Inferno Orange" interior trim package is also available with leather interiors. A leather-wrapped steering wheel and shift knob, redundant steering-wheel controls, Bluetooth and USB port are part of the available "Driver Convenience and Connectivity" package, which also includes remote start on automatic transmission-equipped vehicles, as well as an interface module for iPods and the like. The available premium audio system is by Boston Acoustics, with nine speakers and 245 booming watts. An optional short-throw Hurst shifter provides quick, concise shifting, and there are a variety of available wheel-tire packages, including 21-inch machined aluminum wheels. Specific to 2012 is the 45th Anniversary Package which can be ordered on Camaro 2LT and Camaro SS. The package includes Carbon Flash Metallic black paint with red and silver striping, unique 20-inch wheels, HID headlamps, unique interior trim and 45th Anniversary badges. The Camaro offers three engine choices - 323-horsepower 3.6-liter direct-injected LFX V6, 400-horsepower 6.2-liter L99 V8 with Active Fuel Management or 426-horsepower 6.2-liter LS3 V8. The V6 can be backed by either a 6-speed manual or a 6-speed automatic transmission. The L99 is accompanied by a 6-speed automatic with paddle-activated driver shift control, while the LS3 has a 6-speed manual. Deciding whether you want a V6- or V8-equipped version is the biggest question you must answer concerning the 2012 Chevrolet Camaro. The LS with V6 has a base price of right around $24,000, with the LT Convertible starting close to $31,000. The V8-equipped SS trim rings the register at just under $33,000 and its convertible counterpart just under $39,000. Options can easily push the SS cars close to or over the $40,000 mark. Unfortunately, the Camaro's popularity means customers will have to bargain hard to make a good deal. Thankfully, our Fair Purchase Price tool, which shows the typical transaction price for the Camaro in your area, can help you make your best deal. In comparison to its American brand competitors, the Camaro is expected to retain a better-than-average residual value than the Dodge Challenger, and a few points higher than the Ford Mustang.